Successful financial planning is directly tied to age and life stage, and those who save early and often put themselves in a stronger position to succeed financially and reduce their overall stress. However, each life stage comes with more acute stresses, as the window and timeframe for saving begins to shrink and lifestyle and household expenses shift. As part of the POPSUGAR Insights 2017 Personal Finance Report, we surveyed nearly 2,000 women between the ages of 18 and 44 to ask them how they manage their finances and think about their financial future. 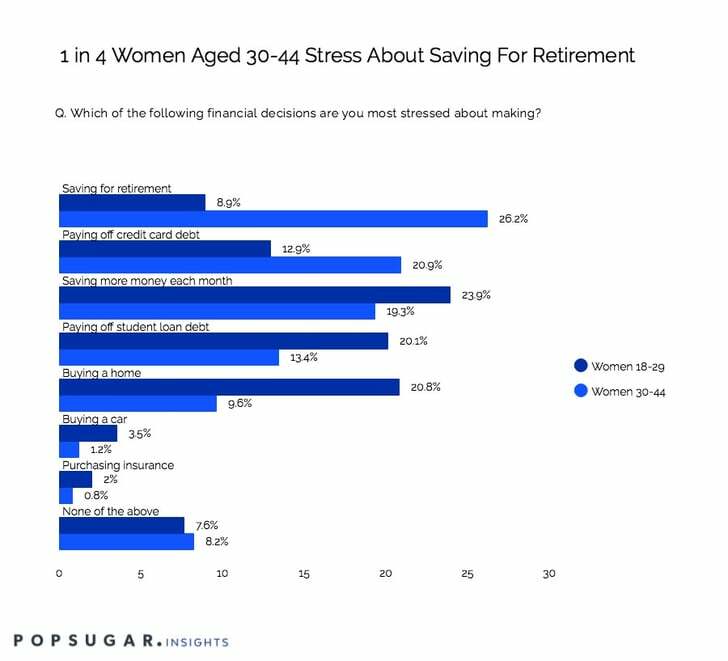 Women between the ages of 30 and 44 are 194% more likely to be stressed about saving for retirement than women under age 30, whereas women under 30 are 24% more likely to be stressed about how to save more money each month. Women under the age of 30 are more likely to be stressed about how to make decisions regarding major purchases, such as a home or a car, as well as the insurance to cover both, while women between the ages of 30 and 44 are more likely to be stressed about how to pay off credit card debt. For brands trying to ease the stress these women are under, it is important to understand the specific pain points by age and life stage and to offer content that helps to educate, budget, prioritize, or plan for major purchases. Brands can also help to ease the stress in other ways by creating content that helps women make beneficial changes to other areas of their lives, such as ways to exercise or look great without breaking the bank, or how to save more each month by discovering less-expensive products that suit their daily needs and routines.